The first walk with a new baby is a big event for a grandmother, so Susan's face is radiant as she pushes the pram with little Sally in it through Howard Park and across Kilmarnock Water. "Take my photo, take my photo," she says. "Make your smile a little smaller," I tell her, as I sight through the viewfinder to compose the shot. "It's filling the field of view." Lunch in the Longhouse is the plan and it should have been an uneventful walk to get there. But we figured without the seagulls. They like it around here, but Chuck does not like them. "They swoop down and attack me," he explains. "How should I know?" he says. "Maybe if you're a seagull I look like a fish." Susan opens her mouth to say something smart and closes it again without doing so. I'm impressed. 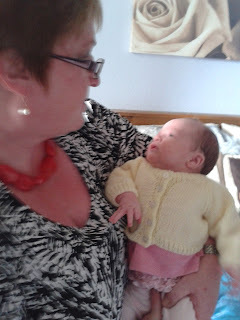 "Being a granny suits you," I say. "You're becoming sensible, mature and restrained." "That'll be the day," she says. Up ahead a squawking flock of herring gulls is delving yellow beaks into food scraps someone has dumped, down by the river. We make a wide detour. "Laridaphobia," I say and wait for someone to ask me. No one does. "An intense and irrational fear of seagulls," I say. "Laridophobia." "There's nothing irrational about it," Chuck says. "They attack people." "Only if you look like food or threaten their young," I say. "I read about one woman who kept getting dive-bombed by a herring gull in her garden that had made a nest on her roof." "There you are then," he says. "She started wearing a colander on her head for protection," I tell him. "Now that would suit you," Susan says. On the outside, the oldest pub in Kilmarnock remains rather rustic. Inside it's bright lights, blue metal and burnished wood. We settle down, place our orders and ask Marie what it's like being a mum. "We're still not getting much sleep," she says. "Every three or four hours she wakes, wanting to be fed. And sometimes she cries and cries and I don't know why." Lines of stress furrow her forehead for a moment, then her left hand reaches out to the pram and touches the bundle lightly, and her face starts to soften. "I didn't think I was all that maternal," she says, stroking little Sally. "But she is lovely, isn't she?" "She is gorgeous," her gran says. "The most beautiful baby in the world." "See that's my point," I say. "A granny gull would feel the same. You got to expect grown-ups to protect the young in the family, whatever the species. "Next time a gull attacks you, young Chuck, just picture it as Susan, sweeping down from the sky." The colour drains from the young lad's face. "Bloody hell," he says. "Now I am scared."